Baldwin Hamilton Studio Upright Piano 1980 Walnut Like New! $1750 – See Video Tour! Classic American hand crafted studio upright piano. Like new, pretty walnut, very low mileage, light playing time. Circa 1980. Matching bench. Warranty. Free LI/NYC delivery. Questions? Call Sonny Direct 631 475-8046. Classic American well made hand crafted Baldwin Grand Piano “The Model L” 6’3″. Beautiful Walnut, just refurbished, action re-regulated, furniture received a French Polish. As with all of our pianos our technicians go over everything making multiple adjustments to each and every note to get the piano playing on a optimal level. Baldwin L’s are renowned for their crisp, clear, rich, full spectrum tone and are frequently found in recording studios, on concert stages and other in other performing venues. This one made in 1962 had just one private owner who kept it in her smoke free home and played it for recreation. Warranty. Free Long Island/NYC delivery. All else continental USA only $475. Questions? Call Sonny at 631 475-8046. Baldwin top-of-the-line professional studio upright piano. Made in the USA. Special Edition Art Case Baldwin Studio Upright, 45″ tall, gorgeous mahogany, hand carved music desk and case trim. Showroom condition, rarely played. Beautiful, rich tone and very responsive action. Made in 1997. Warranty. Free Long Island/NYC delivery. All else continental USA only $475. Questions? call Sonny Direct 631 475-8046. 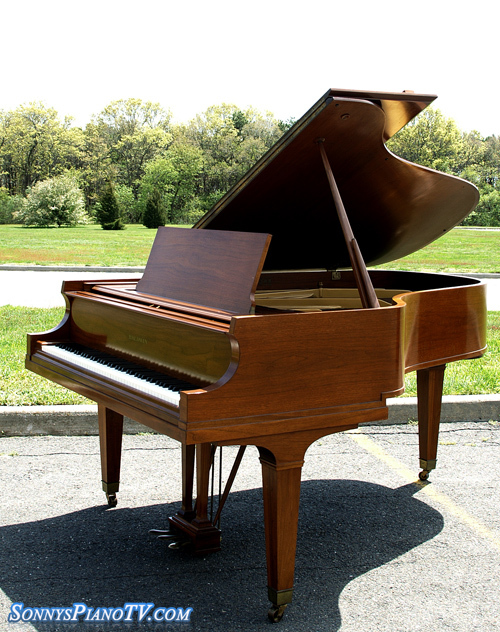 Baldwin Hamilton Baby Grand “Player Piano” 4’8″, Burgundy Mahogany, like new, under two years old. Baldwin Concert Master Player System with speaker. Comes with 18 CD’s. Beautiful furniture piece, great sounding instrument. Comes with Warranty.Free Long Island/NYC delivery. All else continental USA only $475 for delivery and set up in your living room. Questions? Call Sonny Direct at 631 475-8046. All of our pianos come with a WARRANTY. We automatically regulate all of our actions, fix and align anything that needs it. We French polish or refinish every piano so when you purchase from us the piano is ready to go into your living room as a beautiful furniture piece and will play perfectly and last indefinitely. We take the worry out of purchasing a piano. Gorgeous Walnut Art Case Baldwin Baby Grand Piano Model M 5’4″. Queen Anne legs, decorative music desk and pedal lyre. Sublime Baldwin tone and very responsive action. Recently rebuilt and refinished. New hammers, strings, dampers, pins, bushings, finish, regilded plate. Everything like new. Originally made in 1957. Questions? Call Sonny Direct 631 475-8046. Free Long Island/NYC delivery. All else continental USA only $475. Baldwin Baby Grand Piano Model M 5’2″ 1988, Like new! Originally $17K. Gorgeous walnut furniture and grain. Piano lightly played briefly by one owner. Impeccable condition. Family kept it spotless. Still has original store stickers on it. Great rich, sublime tone and like new action response. Piano just regulated. Very special piano. Free LI/NYC delivery all else continental USA only $475. Warranty. Questions call Sonny… 631 475-8046. Baldwin Baby Grand Piano 5’2″ 1936. Partial rebuild about 20 years ago; restrung, new key tops, dampers, hammers and refinished. Classic pre-WW2 American hand crafted rich Baldwin tone. Action just regulated. Excellent inside and out. Questions? Call Sonny Direct at 631 475-8046. Free LI/NYC delivery. Warranty. Only $475. delivery and set up anywhere continental USA. 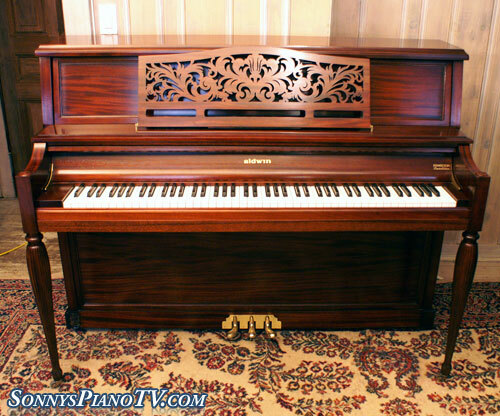 Baldwin Piano Baby Grand Beautiful Walnut Model M 5’2″, pristine. Great Baldwin hand crafted, American made piano. Rich, clear, crisp tone. Responsive action. One owner. Comes with warranty. All of our pianos are gone over by our furniture department and technicians. Free LI/NYC delivery. All else continental USA only $475. Questions? Call Sonny Direct 631 475-8046.